Casey Morans is the perfect place in Chicago for your next event! We work closely with each party to create custom packages to suit their needs. Our event coordinator will work closely with you to plan the perfect event! Casey Moran’s is known as one of the best venues for a semi-private or private holiday party, whether it’s for your company, school or for friends and family! Our event coordinators work closely with each party to create custom packages to suit their needs. If you’re looking to speak to someone directly about your event, please send in an inquiry and we will get back to you shortly! 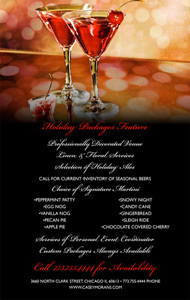 Hosted cash bar or party package? Any interest in food packages? Group must guarantee a minimum of 15 wristbands sold in order to book a party. Wristbands do NOT include gratuity. Please inform party to tip waitstaff accordingly. Wristband parties will receive express entry and do not have to pay cover. Prices subject to change on Cubs home games. There is currently no information about event packages of this type. Please fill out the form below to inquire about booking an event. Planning an upcoming trip to Wrigleyville to see a game? Contact us for your pre- or post-game party! Whether it’s just a small group of friends or a corporate event, we’ve got space for any type of location! Shoot us an inquiry with some additional information and we’ll help plan your perfect outing. To enter a party request, please fill out the following form.